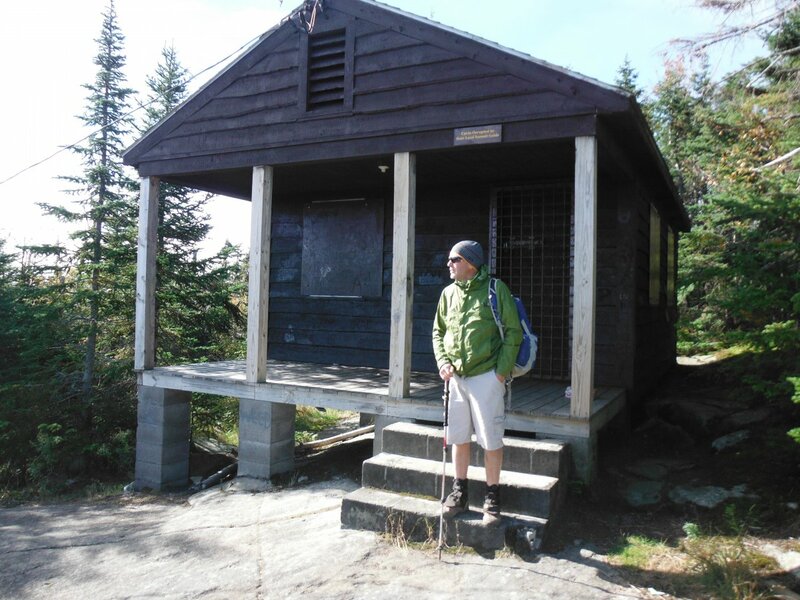 Home/Adventures, Uncategorized/Well, that was a little disappointing. 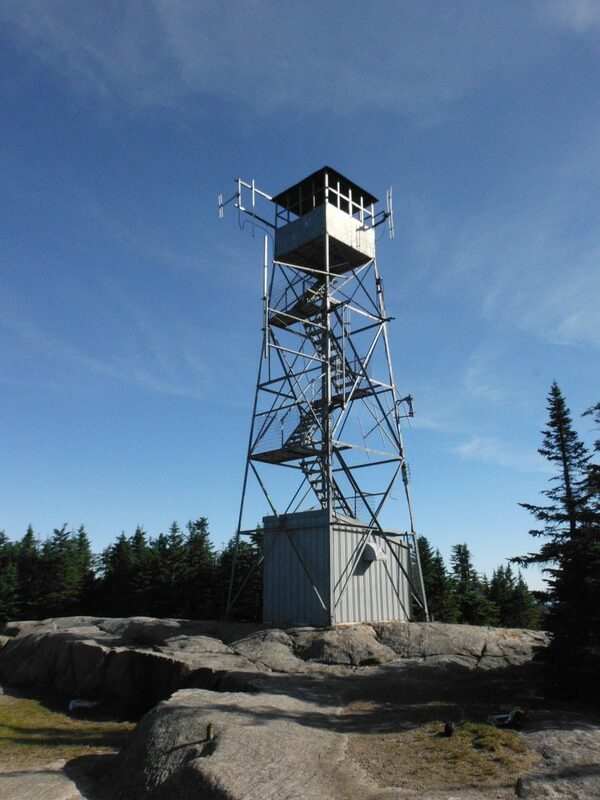 I have to be honest you, I was more then a little bit let down when I saw my first Adirondack Fire Tower. With a name like that I expected to see a tower… on fire. You know flames shooting in the air, showers of sparks in the night, that sort of thing. Once I got over my disappointment, I found them much more interesting intact and not enveloped in flames. 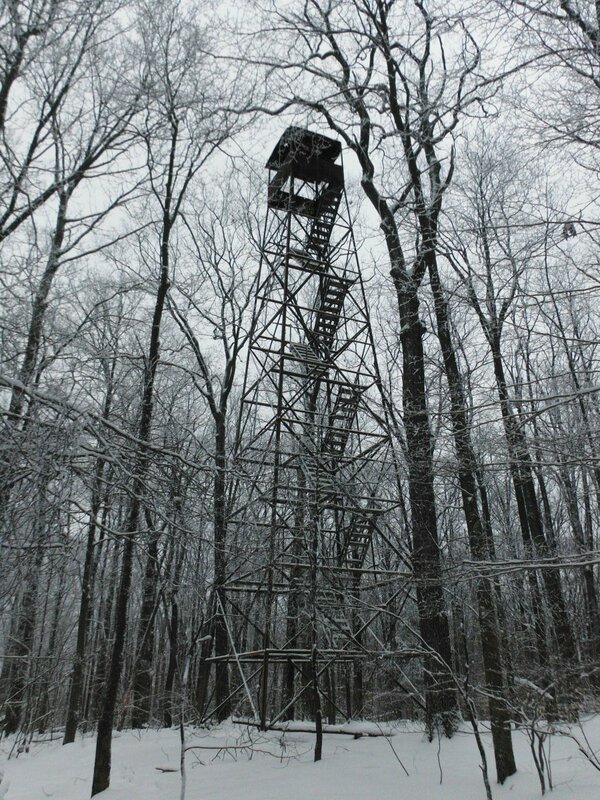 Imagine climbing up a mountain, breaking through above the tree line to see this metal structure shooting 4 or 5 stories into the air resting on four spindly legs. Then it’s up the stairs, which now thanks to many of the “Friends of..” groups are safely fenced in with hand rails. You then emerge through a trap door in the floor into the cab and you realize it was worth all the effort getting there. 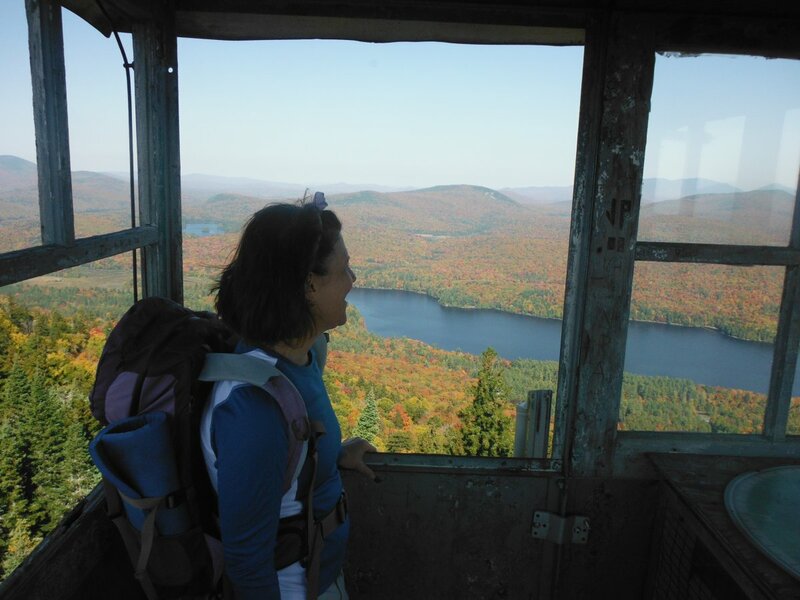 Standing up you look out and are rewarded with unobstructed views in all directions. 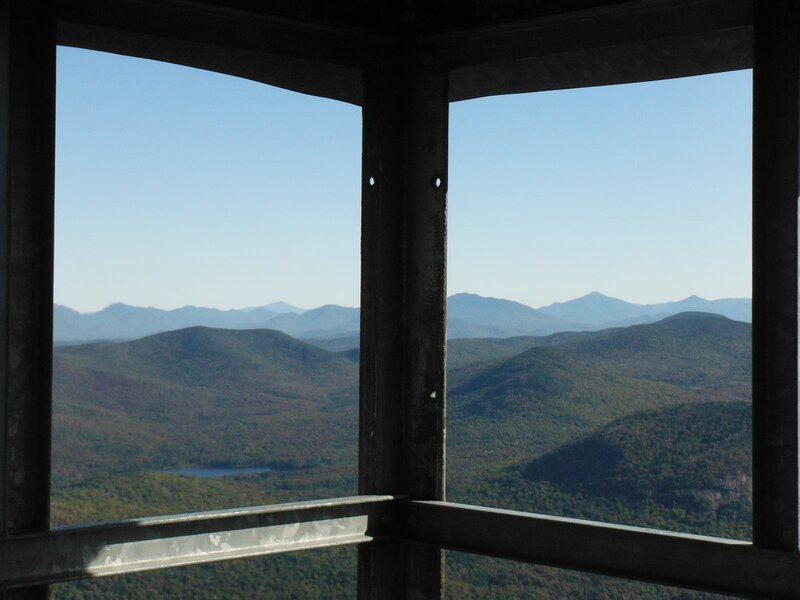 Now these views will vary depending on the fire tower. 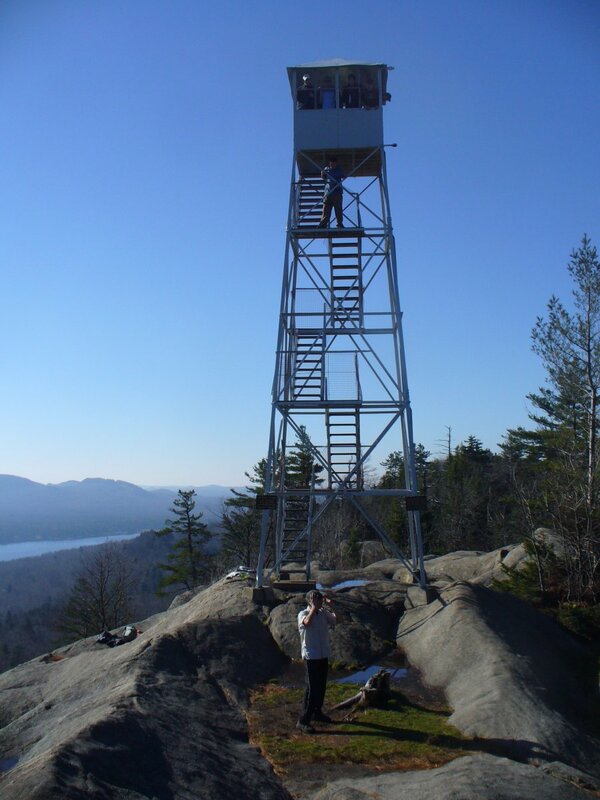 The towers on Pillsbury and Wakely Mountains will provide panoramic views of the surrounding West Canada Creek Wilderness as well as the peaks of the Central Highlands of the Adirondacks. On the other hand Poke-O- Moonshine is going to afford you unlimited views to the east of Lake Champlain, the Green Mountains of Vermont and to the north of Mt Royal and Montreal. 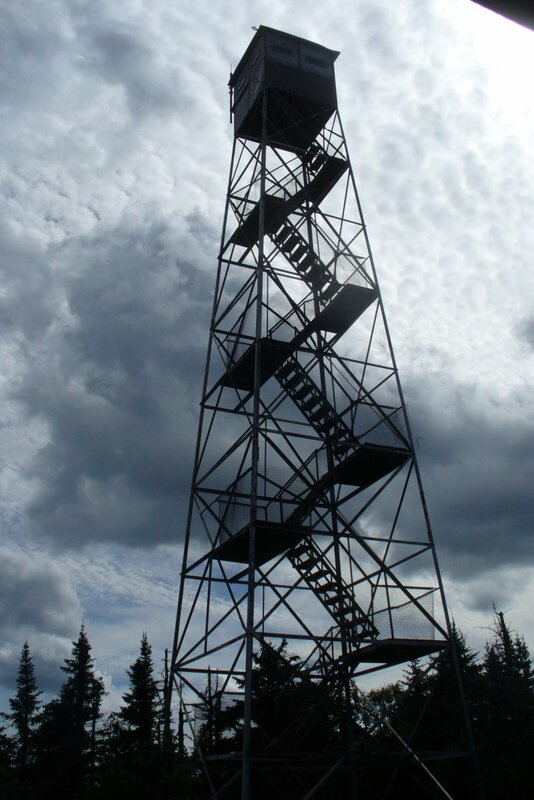 Some require long hikes with strenuous climbs to the top. Others… not so much. 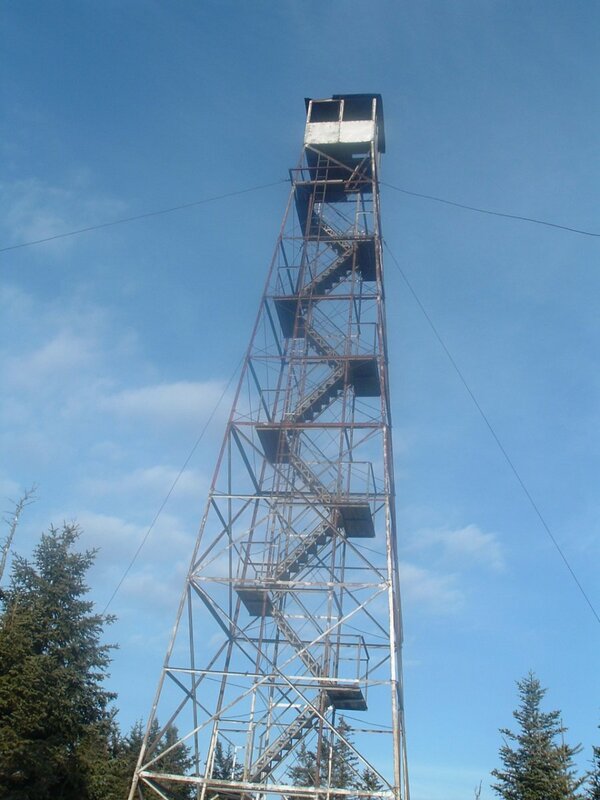 The tower on Belfry located in Mineville, NY is a great one to start with as it is only 0.6 miles round trip. 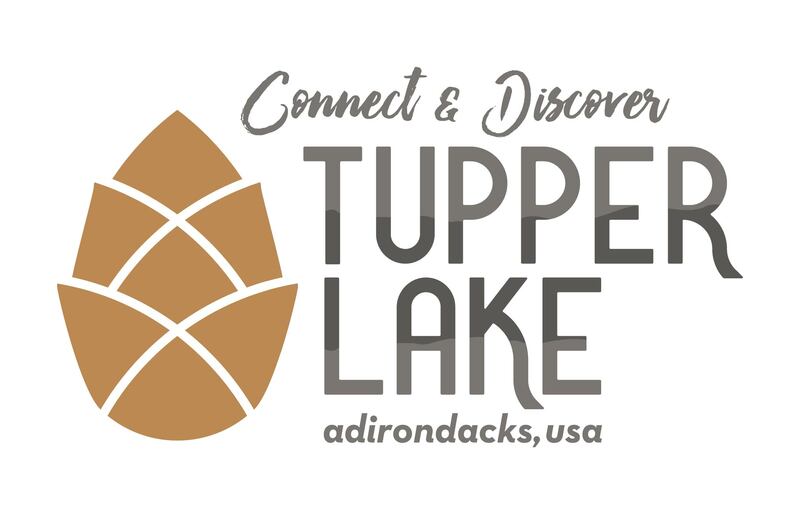 Closer to Tupper Lake you have Mt Arab which is part of the Tupper Traid and is located just west of town off of Route 3. 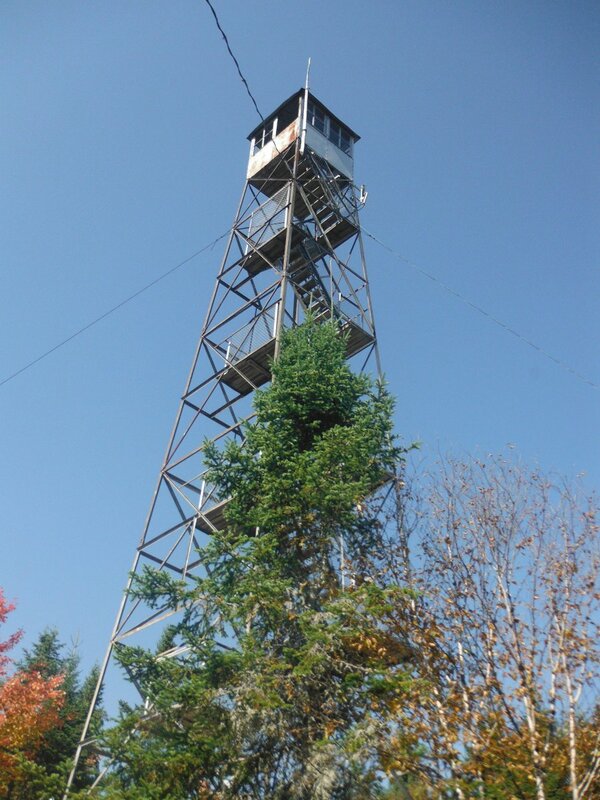 If you want a two’fer just down the road from Arab is Cathedral Rock located on the campus of the Ranger School in Wanekena, NY. 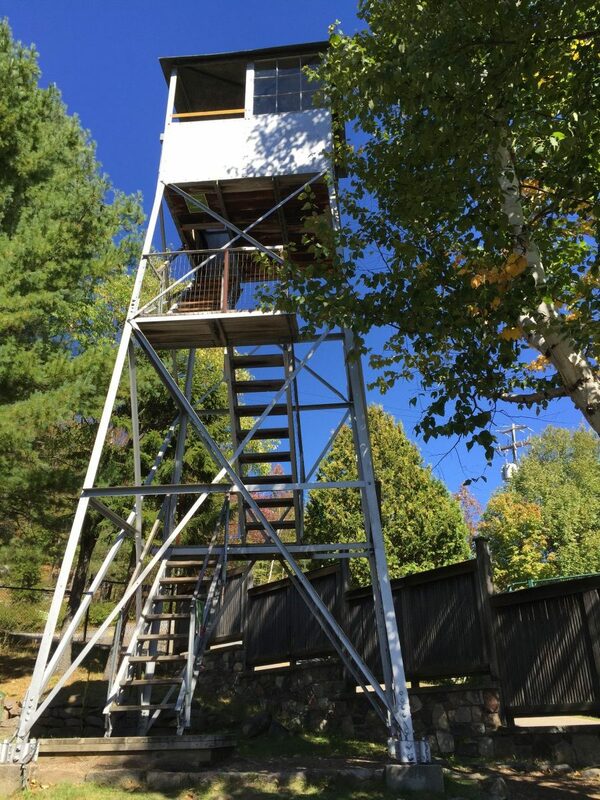 Within 30-45 minutes of the Northwood Cabins you have quite a few to choose from: Goodnow and Adams down in Newcomb, NY. Just north of us on Rt 30 you will find St Regis near Paul Smith’s College. A little further south you have Blue Mt. 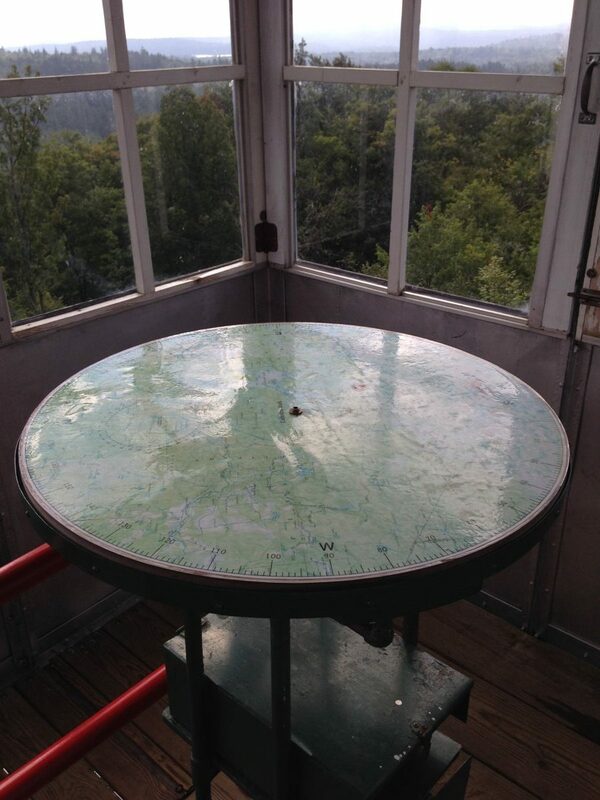 Once you have done these you can start to go further a field and visit all the fire towers in New York, and in doing so you can earn a patch. Oh… and that thing about me expecting a big tower on fire, lets keep that between us. That kind of makes me look bad.